Don Bluth does well with mice. The Secret of NiMH was his breakthrough, and remains a very strong movie. But perhaps his biggest cultural hit was An American Tail – though I’d have to say there’s stiff competition from dinosaurs. Another one I haven’t viewed for many years, as a child much of the significance of this movie went over my head. I didn’t have a clear idea of the imagery immigrants to the States expected in the late 19th century, let alone understand a thing about Russian Jews. To a child, those nuances probably don’t matter so much. But they’re very interesting as an adult. 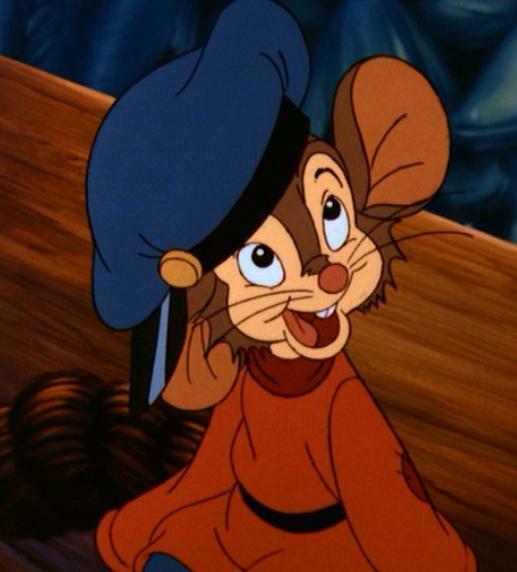 An American Tail does absolutely everything better than All Dogs Go to Heaven. The animation is much better, with Fievel (or Feivel, sometimes) actually being very cute, and rotoscoped/xerographed elements looking impressive without getting too jarring. The story is compelling and each episode adds to the story. The music is fantastic, especially ‘Somewhere Out There’, and whereas All Dogs Go to Heaven tries to incorporate different musical elements through patronising stereotypes, An American Tail actually pays tribute to different immigrant cultures (though some Irish people might see cause for complaint) and spices up musical numbers with traditional musical styles. It even has a message of not judging based on race despite the mice-versus-cats set-up, with Tiger being quite unlike the rest. Where An American Tail succeeds is in its multiple narratives. There’s Fievel looking for his parents, the secret plan he sets in motion, a very simple love story on the side, and the tragicomic conceit of the family always missing seeing their son while Fievel’s sister Tanya never gives up hope. Indeed, perhaps the film’s greatest appeal is its contrasts between sadness and hope. Bluth is also allowed to be playful. Monstrous waves are very much in his style, and he adds in many fun touches like distorting glasses and an inventive sequence with the water sloshing about in a boat. Maybe I could have done without the final Statue of Liberty sequence, but this is in every way a strong family film and deserves to be remembered every bit as fondly as Disney’s classics. I very much enjoyed going back to this little story – and even if Bluth is not involved, I’ll be sure to watch Fievel Goes West at some point.